Valentine’s Day is approaching fast, ladies and gentlemen, so consider this a public service announcement that ties directly into the holiday: please, whatever you so, if you plan a date at the cinema with your other half on February 14th, go see The Shape of Water instead of Fifty Shades Freed, which also happens to be out around that time. Having seen it twice now, I can absolutely guarantee you that it will be a far more romantic, uplifting and spiritual moviegoing experience with your significant other than that other movie (I know it’s unfair to pass judgement on a film before even seeing it, but come on, it’s bloody Fifty Shades Freed; everyone and their horny grandmothers know that it’s going to be a great big pile of trash at best), not to mention that it’s an incredible film that absolutely deserves your attention no matter what. As I mentioned in my previous review for this film, from when I saw it back at the BFI London Film Festival in October, on a technical and emotional level this may very well be one of the most passionate and beautifully-told films of Guillermo del Toro’s career, and a solid contender for one of my new favourite films ever. A second viewing not only reaffirms that, but it’s so meticulously crafted and wonderfully executed that it feels just as impressive a piece of filmmaking as it did the first time. The story is of a young woman named Elisa (Sally Hawkins), who is mute following an incident from her childhood that saw her vocal chords ripped out. She works as a janitor at a top secret government facility in 1960s Baltimore, and counts her closeted next-door neighbour Giles (Richard Jenkins) and fellow cleaner Zelda (Octavia Spencer) as her only friends. During one shift at the facility, she encounters the newest and most valuable asset which happens to be an anthropomorphic sea creature (Doug Jones), and through non-verbal communication begins to form a strong connection with him. As she witnesses the brutal and inhumane treatment of the creature from its cruel handler Colonel Strickland (Michael Shannon), she enlists the help of Giles and Zelda, as well as facility scientist Bob (Michael Stuhlbarg) who it turns out has his own orders regarding the creature, to break it out and eventually set it free, but not without exploring her own passions with the amphibian first. It is certainly unconventional and sometimes surreal to witness a woman develop romantic and physical feelings for a movie monster that’s on loan from Creature From The Black Lagoon, but del Toro never does anything by the book and always seems to follow his heart in telling the strangest yet most endearing stories he can conjure in his gifted mind. With this film, he has been given full reign to tell this story exactly how he wanted to tell it, and for all of us it is a great pleasure to see him be given such vibrant and stunning storytelling tools with which to tell it. Everything that he utilises from the production design to the cinematography to the sound effects and beyond helps tell an adult fairy tale that only he could make work as well as it does, and you can tell in every frame of the finished film that he is completely in his element whilst bringing it all to life. He is a fantastic filmmaker with passion to spare, and it’s so wonderful to see his vision pay off in an extraordinary fashion with awards nominations left and right, as well as audiences and critics who have responded to it phenomenally; both screenings I have been to for this film have had them gasping, laughing and cheering at the right moments, which is something you couldn’t say about most of the other Oscar nominees for Best Picture this year. It is del Toro’s film through and through, but there are parts of it that also belong to the actors he has brought on board to give just the most perfect performances you could imagine. Hawkins gives a wonderful physical performance where she doesn’t even need words to convey the countless emotions she experiences throughout the film; Shannon is intimidating and menacing as ever, but scenes that show him in his everyday life help humanise him and make him out to be a bit more than just the snivelling villain who in the kind of 50s B-movie this is paying homage to would have probably been the hero; Jenkins and Spencer, the two other Oscar nominees for their roles in this, give great support and are strong and likeable characters in their own ways; and Stuhlbarg continues to be one of today’s most valuable character actors in a role that’s interesting and conflicting all in one. The way that del Toro directs these talented actors is with the right amount of whimsy, with none of them coming off as false or pandering, and in return they give the audience a collection of characters who you can easily root for or against but always understand who they are as actual human beings, which makes it a far more compelling story being told that isn’t all just black and white. There’s no doubt that The Shape of Water is an absolute treat of a movie, filled with such passionate filmmaking that it’s downright inspired, and all centred around a story that’s certainly odd from the outset but has its heart and influences in just the right place. I strongly urge you – nay, plead with you – to make the right choice this Valentine’s Day if you plan on taking your significant other to the movies; you can either drag them along to the third and mercifully final film in a series of trash and incompetent storytelling, or you can whisk them towards one of the most endearing, original and absolutely romantic films to ever come from the mind of a brilliant filmmaker. It’s your choice, but don’t be surprised if they break up with you after seeing Fifty Shades Freed begrudgingly. 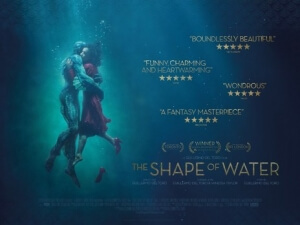 The Shape of Water continues to astound with its passionate filmmaking and beautifully-told story that director Guillermo del Toro utilises every tool in his grasp to tell with such honest love and dedication, making it one of the most endearing, original and romantic films you can take your other half to see this coming Valentine’s Day.